Who needs to go out of their way, to spend time in traffic and wait in line, only to receive a hot, sugar-sweetened drink in a non-recyclable cup and spend precious money on a latte that can otherwise be blended to perfection right in your own home? Not you. Not anymore. You can get good jolt of caffeine outside of a coffeehouse and save money by doing it too – trust us, it is the best way to start your day! You could always drink it as a pick-me-up in the afternoon, and make your co-workers envious of your nutritious and delicious Paleo latte. Since you are making this from the comfort of your kitchen, you can play with the coffee flavors, and strength, by using whichever brew that suits you best. Choose the best coffee available and opt for fair trade and organic beans that are freshly roasted, if you can get it near you. If you are already a serious coffee drinker you may already have your favorite roast, but if you are unsure, know that a medium roast always makes a fantastic latte. It is more about the milk – in this case dairy-free and all about the cashews. And remember to prep the cashews by soaking them in water overnight, so the latte process goes smoothly in the morning, just as you are waking up – make it strong and it will be a real eye-opener! As a reminder, it is officially pumpkin spice season, so here are 25 more ways to enjoy the flavor (includes mouthwatering cookies, cakes and drinks). To make the cashew milk, cover the cashews with cold water and allow to soak overnight. When you are ready to make the latte, drain the cashews then place in a blender with 1 cup water and blend until smooth. This makes a thick cashew milk/cream, but if you want a thinner consistency simply add more water. Add the coffee, pumpkin spice and maple syrup to taste and blend again. 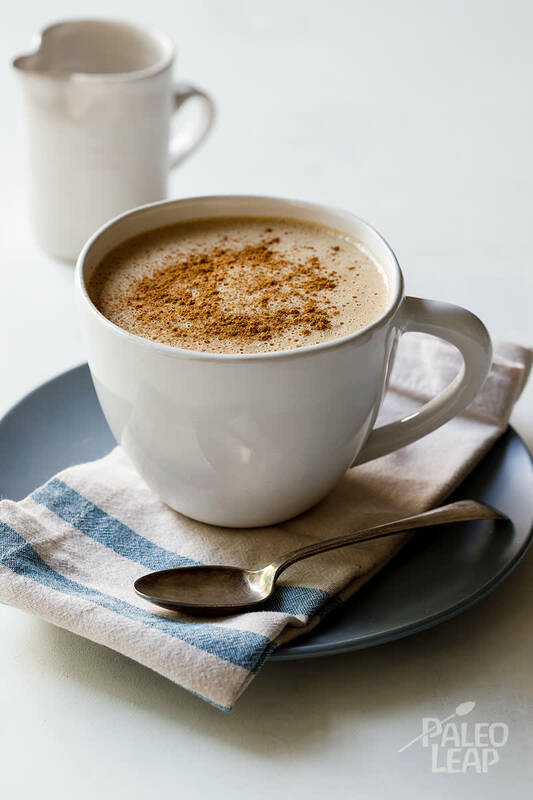 Pour into mugs and top with the ground cinnamon before serving.